You’ll love this guide if you want to take advantage of all the Influencer Platforms and Networks that work to connect influencers with brands. Most of these networks can help you to make money via your influence! 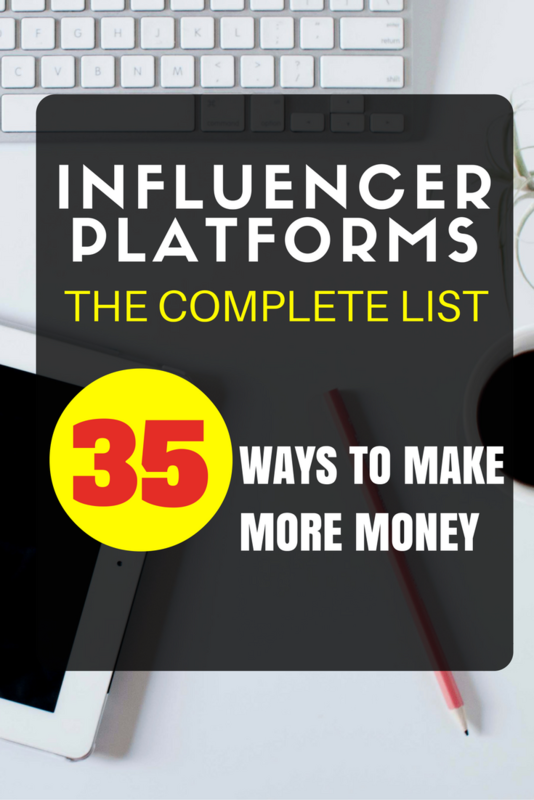 All the Influencer Platforms on this list are searching for influencers to join their network. We’ve also joined all the platforms ourselves to test and report back all the details to you. These platforms are listed in alphabetical order. Advowire is created by the HireInfluence marketing agency. We collaborated with Hireinfluence for a Facebook Live Streaming campaign that paid well. This campaign was facilitated by the AdvoWire platform. We love that the platform offers you more opportunities to share your content. There is also a campaigns board where you can apply for paid opportunities. There aren’t a ton of opportunities available but the ones that are available are high-quality campaigns. There is also an opportunity to post content (printables, articles, photos, etc) that you have created and make it available for sale. ApexDrop works specializes in working with fashion influencers. Influencers can connect easily with fashion brands that they would like to collaborate with. This network has a unique model, influencers with 1000 followers qualify for deep discounts, 3000 followers = free product, 10,000 followers = paid campaigns. Also, we love that they have a super cute sign-up form. BrandBassador is by invite only but you can easily request an invite. BrandBassador calls its campaigns “missions” which makes engaging with them extra fun. The interface of the website is super user-friendly and fun to use. There are paid missions and points based missions. The purpose of the points is to earn them to redeem for big prizes. For example, BrandBassador took the top 10 points earners on a yacht to the Carribeans. That works for us! BrandSnob works like a Tinder for Brands and Influencers. Influencers can swipe right for the brands that you would love to work with. Brands will connect if they think its a good fit! Apply and you will receive an approval code if you are accepted. Focused on extremely beautiful photography and stunning videography, Cycle works with Influencers that create extraordinary content. If we were to guess, we think that Cycle focused on working with influencers with huge followings but we don’t know for sure. We submitted an application, still waiting to hear back! The Everywhere Society is over 4,500 members strong! They feature a proprietary software called Influencer Connect that’s basically the “Match.com” for influencers and brands, allowing them to pair influencers and brands for opportunities. Famebit is a self-service marketplace connecting brands with influencers. It was originally created for Youtube influencers so you’ll find a lot of opportunities featuring video content. Brands submit opportunities and influencers can bid and pitch for any brand opportunity available on the website. We especially love Famebit’s Collaborations section, we didn’t see anything like it on any other influencer platform. Here influencers can post requests for collaborations with other influencers – you can easily connect with Influencers that are actively looking to collaborate. Fullbottle has an interesting format. Influencers can bid how much they want to charge per like, for example: 25 cents per like. What we really like is that Fullbottle also shows the total budget that the brand has available to spend on the campaign. Finally, we like the campaign submission form, it’s well designed and user-friendly. Grapevine connects brands with Instagram and Youtube Influencers. You can view all available opportunities right after you connect your Instagram or Youtube account. We love that the campaigns clearly list minimum followers required to apply for a campaign. We hate wasting time applying for campaigns where we aren’t a good fit! We definitely recommend signing up with Find Your Influence. Connect all of your social sites and Find Your Influence will reach out to you if they have a campaign for you. We have successfully completed five campaigns with Find Your Influence with a Facebook Fan Page with a large following and a Twitter page with a much smaller following. IMA seems to be a fashion-focused influencer marketing agency focused on Influencers with higher social media followings. They represent over 4000 fashion and lifestyle influencers. Influenster is focused on connecting influencers to free product. This is not a website that you would apply for paid opportunities but if you are looking for products to review this coule be a good resource. Connect your social channels and brands will reach out if they are interested in working with you. Influicity boasts over 140,000 influencers in their network. Instabrand is an elite influencer agency based in Los Angeles working with top tier influencers. They are launching a new influencer portal soon. We assume that it will allow for collaborations with more emerging influencers since the agency itself is quite exclusive. We just signed up at Intellifluence, we are guessing that they are set up to connect influencers with brands on Amazon needing product reviews. Will include more information as we have it! At Izea, Influencers can bid money to apply for opportunities. Not really our cup of tea but it might be worth checking out. You can also post products and earn a commission for product sales. IFabbo closed up shop and recently re-opened as Massive Sway. There are few campaigns available but all are of high quality. It is annoying that when applying for brand campaigns, you have to manually enter your social media stats and handles. This information should already be saved on the website as there is a section for each influencer to input all those details. The website just launched so maybe they are still working out all their glitches. We appreciated that Massive Sway is the only network on this list that allowed you to input your Periscope stats. Network niche is a network of over 2,500 influencers. Once you are registered, they will email opportunities to you via their newsletter. We assume the opportunities are heavily blog related as influencers are required to display Network Niche’s badge on their websites. Obvious.ly has a super well-designed website. Point and click to easily submit and apply to the available campaigns. They also have a unique bonus points system where you can earn cash. You can earn a “corgi” each time you complete a campaign on-time and followed all instructions correctly. Three corgis = $20 cash, a pretty cool and easy perk! Easily apply to collaborations, both paid and product only via the Popular Pays app. It’s a beautiful app providing detailed information about the requirements of each campaign. Super transparent, we love that! Most of Ready Pulse’s campaigns call influencers ambassadors, we think that you will more likely receive quality products rather than paid promotions on this platform. Apply for paid or free product collaborations with brands via their app. We’ve been rejected by most of our collaboration requests, we would love it if Revfluence could post the minimum following required to apply for a campaign. Otherwise, Revfluence treats their influencers great, they threw a killer holiday party last year where all their influencers left with huge gift bags filled with quality products. Snapinfluence doesn’t have a website set up for influencers but they will email their influencers internally with available campaigns. We signed up to the mailing list, will report back if we receive anything! Social Native is pretty active with it’s Instagram campaign availability. We like that the network shoots you an email when a campaign shows up that would be a good fit for you. They have tons of campaigns available, we receive emails with campaign opportunities several times a week. Socialix has a really cool infographic style overview of your influence over different social media networks available once you have signed up to the website. It might be worth signing up just to check it out and maybe take a screenshot of it to use in your press kit. Scroll their marketplace to view their plentiful campaign opportunities. Socialyte calls itself an Influencer Casting Agency and works with a roster of over 10,000 influencers. They also specialize in influencer trips or travel activations for high-level influencers. The website was glitchy when we tried to use it and we were unable to view the casting notices page once signed in. Tapinfluence is one of our favorite influencer networks, we’ve made a lot of money with the company. Input all your social media stats and Tapinfluence will email you when they have a campaign that is a good fit. Super recommend! Tomoson specializes in working with Amazon products, mostly you can apply to receive a plethora of products for free in exchange for a review. You will need an Amazon Prime account to receive free shipping. A great perk is that you have the option to review products on Amazon for product exchange only, instead of using your social channels to post sponsored content. You can also opt to apply for paid promotions. This Australia-based app provides a variety of different brands to collaborate with inside their app. One thing we dislike is that we have to create a post and submit the photo to apply for the campaign. We would at least like to know that the brand was interested in working with us before having to deal with such a cumbersome application process, many apps on this list just allow you to swipe right if you’re interested. VRYL recently launched as an influencer platform on the phone. They are probably still working their glitches out, the opportunities aren’t screened so you many have to weed through a lot of low-quality offers to find something you like. You swipe right if you like an opportunity and should be notified when you are matched with brands who are also interested in working with you. The Women’s Influencer Network connects influencers with female-oriented brands. We applied and will share more details if we get accepted! 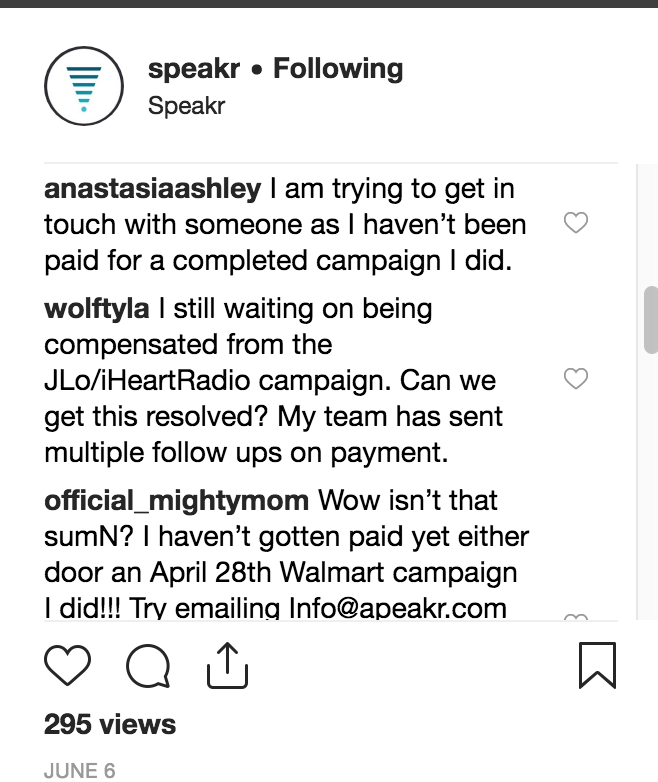 We worked on two paid campaigns with Speakr in June and July 2018. It is now November and we haven’t yet been paid for our campaigns and the company has been completely unresponsive to emails. We hope that this article was useful to you! Please EMAIL us if you have any missing details or want to share any success stories!